Have Questions? Contact our Missions Minister, Kaleb West! 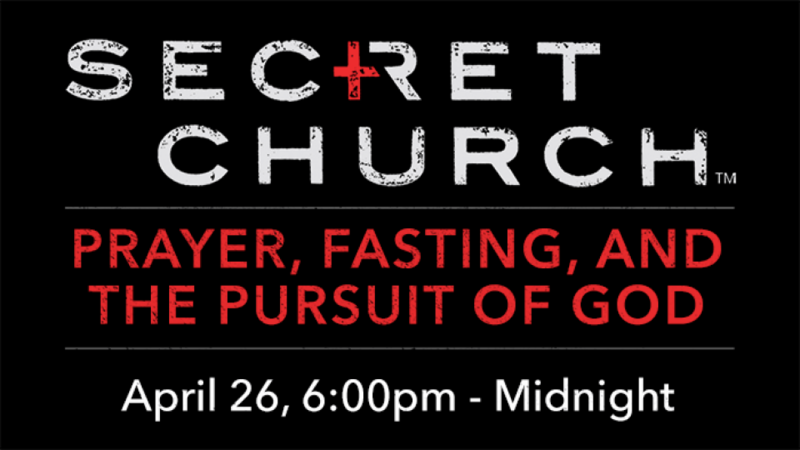 We will be hosting the discipleship event known as Secret Church on Friday, April 26th, 2019 from 6:00pm to Midnight. This year church members are opening up their homes to host small groups to watch the simulcast. Register online, call the church (936-564-1131), or through Sunday School. Secret Church is a unique, one-night event. Encouraged by our persecuted brothers and sisters’ example, we meet for over 6 hours for intense study of God's Word and passionate prayer for the persecuted, led by David Platt. This year's topic of study will be: Prayer, Fasting, and the Pursuit of God. Each participant will receive an event workbook/study guide to take notes and keep up with the over 4 hours of Bible teaching. The purpose of Secret Church is to teach those who have a passion to deeply know God through his word so that they may be better equipped to teach God's Word and make disciples of all nations, and to receive a better understanding of the Church around the world. Secret Church is led by David Platt. He is the author of the New York Times Best Seller Radical: Taking Back Your Faith from the American Dream. David holds two Doctorates and was Associate professor of Preaching and Apologetics at New Orleans Baptist Theological Seminary at the age of 25. He is world renowned for his intense teaching and discipleship.